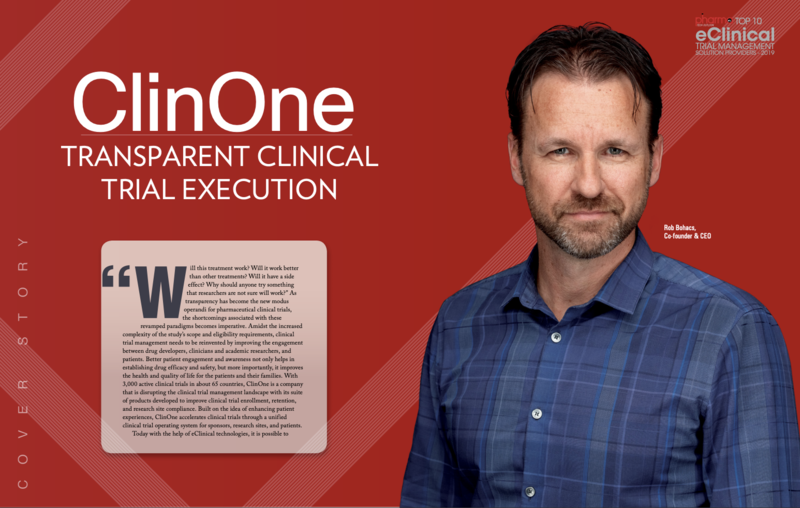 Denver, CO, March 29, 2019 (Newswire.com) – ClinOne, a mobile clinical trial management solution, named Top 10 eClinical Company for 2019. ClinOne is also honored to be selected for the coveted front cover article in Pharma Tech Outlook’s special edition on eClinical Trial Management. ClinOne was selected from dozens of companies nominated for consideration by Pharma Tech Outlook’s subscribers and market research team. The cover article describes how ClinOne’s technologies support research sites and patient engagement through its mobile & web patient platform, which includes eConsent, digital concierge for patients and their families, BYOD ePRO and Patient Voice surveys. All of which is being applied to deliver on ClinOne’s ability to support virtual clinical trials. ClinOne’s CEO, Rob Bohacs, tells Pharma Tech Outlook, “The better our technology, the more successful a patient’s experience during his or her clinical trial – thereby reducing patient dropout rates along with significantly reducing the number of protocol deviations”. ClinOne solutions were created to improve patient enrollment & engagement and research site compliance by allowing important trial details to be at the fingertips of participating researchers and patients. Currently, ClinOne is working with 1,900 research institutions in 55 countries on over 3,000 active clinical trials. Visit www.clinone.com for more information.